On Sunday, April 29, three Veazie staff members (Krista, Kelly, and Dr. Julie Keene) and Dr. Keene’s husband and son traveled to Avian Haven, a wild bird rehabilitation center in Freedom, Maine. Every spring, there is a great deal of work to prepare for a busy summer of injured or sick birds, and to catch up after a busy winter! When I first visited in February, Diane Winn was feeding a loon that had both been shot and had ingested three fish hooks. The loon had been there for two months and was holding his own. Marc Payne, the other rehabilitator, showed me around several avian houses on the premises, providing homes for crows, owls, eagles, and hawks among others. Some were long term residents, others were gaining strength for release. Marc noted areas where they would be building a “pool house” for water birds (like the loon and a female wood duck inside in a bathtub) who need more space than what they can provide currently, and another flight house as well. Just a couple of weeks ago, Bangor Savings Bank awarded Avian Haven a $5000 grant from their “Community Matters More” program to aid in the construction of these facilities. While we were there, a couple from Machias arrived with an osprey that had been bleeding from chest wounds. A warden had brought her to this couple for transport to Avian Haven the night before. They let her rest before undertaking the four hour drive. When she arrived, the osprey was very stressed, and when she was lifted from her carrier, an egg was found with her!. Marc x-rayed her for broken bones or any internal injuries, and thought that there might be another egg inside her. Then Diane held her while Dr. Keene debrided two puncture wounds on either side of her chest. It was unclear what had happened to her, but after she was cleaned, Marc and Diane gave her fluids with electrolytes and gently placed her in a crate to rest. As of the following morning, she was doing reasonably well. She had been anesthetized to clean her wounds again and to repeat the xray. They had thought on the first one that there was another egg to be laid, but with that morning’s xray there was no more density there. So everyone is quite baffled….Diane said she would keep us apprised as to her progress. If you would like to learn more about Avian Haven, please go to their website: http://www.avianhaven.org/ They are a wonderful operation doing astounding, creative things to help save birds who are injured or ill. Since their funding is completely by donation, they operate on a tight budget and think outside the box to made do with what they have. In an extra push to help Avian Haven, one of our technicians, Jessie, has pencil-drawn a beautiful chickadee picture. Her husband Adam, of School Street Framing in Brewer, framed it and we are raffling it off as a fund-raiser for Avian Haven. It is in our lobby at the clinic for now and you can also view it on our website or our Facebook page. The drawing is to be held June 1, 2012 and tickets are $1/each or 6/$5. If you are not able to get in to purchase tickets before June 1, call us with your credit or debit card number and we will transfer the funds to the raffle when we enter your tickets into the basket! We will mail you your ticket stubs. 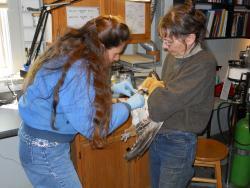 Another way to help Avian Haven is to volunteer to transport birds, either the whole way or part way. Find our how on their website, or call them at 207-382-6761.